El nombre oficial del Uruguay es “la República Oriental del Uruguay” y está ubicada en el Cono Sur de América del Sur. Limita al norte y noreste con el Brasil, al oeste con la Argentina, al sur y sureste con el Rio de la Plata y el Océano Atlántico. Uruguay tiene 176.215 km2 de extensión y una población de 3.300.000 habitantes. La tasa de alfabetismo es del 97%. El clima es marítimo templado sin temperaturas extremas entre los 0 grados Celsius en el invierno (junio a agosto) y los 35 grados Celsius en el verano (diciembre a febrero). La primavera y el otoño son los meses más lindos del año con temperaturas entre 15 y 25 grados Celsius. La economía del Uruguay se basa en la agricultura y la ganadería y está rodeada de países vecinos agrícolas como Brasil, Argentina, Paraguay y Chile en la región. Uruguay tiene una sociedad cosmopolita como resultado de sucesivas inmigraciones europeas. Tiene una sociedad abierta con gobierno democrático elegido con elecciones libres cada cinco años y promueve la tolerancia de todas las religiones e ideas políticas así como la no discriminación. Major credit cards (Visa, Mastercard, AMEX) are accepted at most hotels, restaurants and shops. PUNTA CARRETAS SHOPPING: open daily from 10am to 10pm. The official language in Uruguay is Spanish, but English is widely spoken, being taught at schools as a second language. April is autumn time in Uruguay. Temperatures are variable and range from 15ºC up to 20ºC; however days may be sunny and temperatures can go up to 25ºC at midday. It is suggested to bring winter clothes such as coat or rain jacket, scarfs, etc. as it can also be windy, rainy or even cold in April. ARGENTINA, AUSTRALIA, AUSTRIA, BAHAMAS, BARBADOS, BELGIUM, BELIZE, BOLIVIA, BRAZIL, CANADA, COLOMBIA, SOUTH KOREA, COSTA RICA, CROATIA, CHILE, CYPRUS, DENMARK, ECUADOR, EL SALVADOR, SLOVAKIA, SLOVENIA, SPAIN, UNITED STATES, FINLAND, FRANCE, BRITAIN, GREECE, GUATEMALA, NETHERLANDS, HONDURAS, HUNGARY, ICELAND, IRELAND, ISRAEL, ITALY, JAMAICA, JAPAN, LATVIA, LICHTENSTEIN, LITHUANIA, LUXEMBOURG, MALAYSIA, MALTA, MEXICO, MONACO, NICARAGUA, NORWAY, NEW ZEALAND, PANAMA, PARAGUAY, PERU, POLAND, PORTUGAL, REP.OF BULGARIA, CZECH REPUBLIC, DOMINICAN REPUBLIC, ROMANIA, SOUTH AFRICA, SEYCHELLES, SWEDEN, SWITZERLAND, TRINIDAD TOBAGO, TURKEY, VENEZUELA, EUROPEAN COMMISSION, OAS PASSPORTS, UN PASSPORTS. 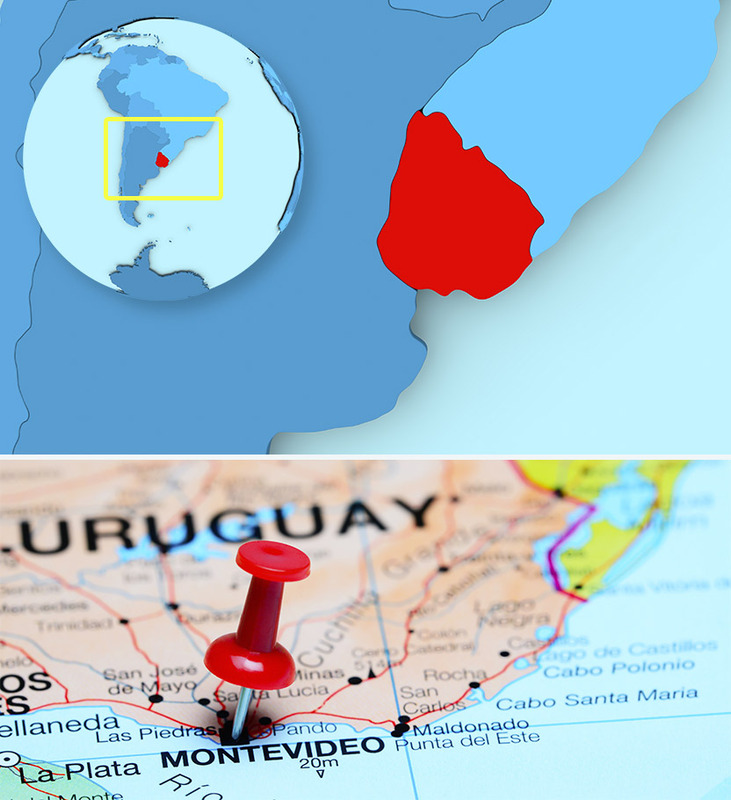 To obtain more information on permits for entry into Uruguay and the respective visas, we suggest visiting the Ministry of Internal Affairs website where up to date information is available: http://dnm09.dnm.minterior.gub.uy/visas.php and http://www.mapaconsular.mrree.gub.uy/. If visiting Argentina or Brazil please make sure you enquire about their visas requirements. Major International flights arrive into Carrasco International Airport “Gral. Cesáreo L. Berisso” in Montevideo (MVD), capital city of Uruguay only 1 hr ½ from Punta del Este, and only some regional flights directly into Punta del Este airport, specially in the summer season or weekends, 20 minutes from Punta del Este downtown. Major airlines connect via Buenos Aires (Argentina), Sao Paulo and Rio de Janeiro (Brazil), Lima (Peru) , Panama or Santiago de Chile or fly directly to Uruguay. Advice from Uruguay: Every visitor should seek advice from their travel agent or via the internet regarding Visas and Vaccinations according to your travelling plans or stopovers in other countries while coming to Uruguay, even if Uruguay does not require vaccinations. Visas and Vaccinations can be required if travelling to or through countries other than Uruguay, either on their way to or from Uruguay. This information is available on each countries’ travel/health/vaccination websites. Visitors should be aware that transit visas or certificates verifying Yellow Fever vaccination are sometimes required when travelling through some countries; particularly when stopovers are long or flight tickets are split and independent. Same occurs with Yellow Fever certificate requirements. Please establish the likely transit point(s) and make arrangements to obtain a transit visa or yellow fever shots before departure from your country.